Read and understand the operating instructions before use, observing all safety rules. Failure to do so may result in bodily injury. Always wear eye protection that complies with current ANSI Standard Z87.1. Keep all tools and DIY material out of reach of children. Beware of sharp edges when handling tools before and after sharpening. Ensure that the chuck of the drill or Power Pack is located correctly and securely on the drive shift before use. Always keep hands and loose clothing clear of the drill chuck and grindstones. Make sure the power to your drill or Vintek Power Pack is switched off. The Professional and Tradesmen’s Drill Sharpeners are precision made products providing a facility to resharpen both steel and masonry drills in the range of 2mm to 12.5mm (3/32”– 1/2”) diameters. The grindstone operates best at speeds around 3000rpm. Ensure that the drill speed is set maximum and that the hammer action is NOT engaged. For reversible drills also ensure that the drill is set in the FORWARD position only. The Professional model is provided with a base plate and has the sharpener and the drill holder assembled to it. It is recommended that the Tradesmen’s model is screwed securely to a wooden base (See Fig. 1). Ensure that the centre of the drill chuck is in line with the sharpener spindle. 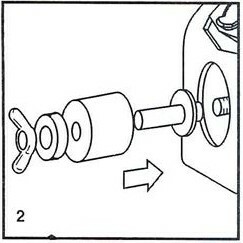 Connect the chuck of the power drill to the sharpener spindle is located correctly in the drill chuck and not offset in the chuck jaws as this could result in damage to the spindle. 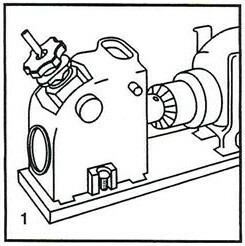 Ensure that the drill chuck is not in direct contact with the sharpener body. 2.2. Depending on the correct cutting angle required (refer to the TABLE OF DRILL CUTTING ANGLES on the reverse of these instructions), the angle of the cam block may be adjusted by simply loosening the locking screw and swivelling the cam block so that the selected angle mark (80 degrees to 130 degrees maximum) aligns with the datum mark on the body. Re-tighten the locking screw to secure the cam block in the correct position (See Fig. 3). 2.3 Select the appropriate collet (White –A,B,C or D) and collet holder (black) for the drill-bit to be sharpened. 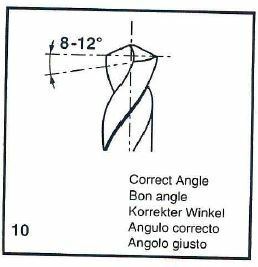 Your collet holders are marked “M” for Masonry bits and “S” for steel bits to ensure the correct grinding angle. 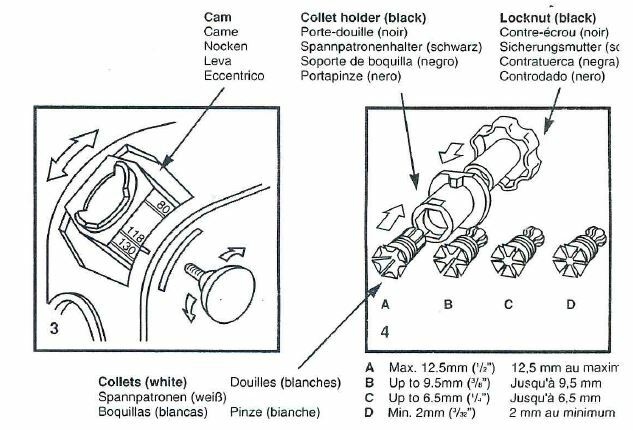 Assemble the collet, collet holder and locknut (black) as shown in Fig 4. Do not tighten the locknut at this stage. 2.4. 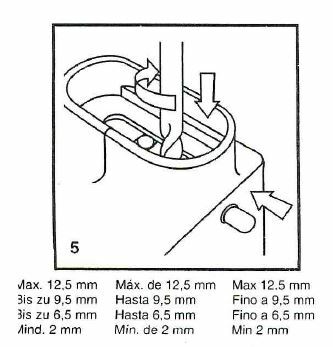 Open the drill clamp on your Drill Sharpener by depressing one of the red button on the side and insert the drill-bit to be sharpened into the “V” setting block (see Fig.5). There are two drill clamp positions – one for drills up to 6.5mm (1/4”) diameter and the other for 6.5mm – 12.5mm (1/4” – ½”) diameters. Select the appropriate drill clamp, place the drill-bit on to the “V” block and turn in a clockwise direction until a positive location is felt when all four edges of the drill flutes touch the “V” block sides. Then apply sufficient downward pressure to depress the “V” block arm onto the grinding wheel. Maintaining the pressure, release the drill clamp button ensuring that the drill-bit does not move from its set position. Warning – The Drill Sharpener has a wheel dressing facility provided and naturally when wheels are dressed the diameter of the grinding wheel will become smaller. To compensate for this, the “V” block is spring-loaded and an extension arm is depressed onto the wheel when setting drills. It is important to ensure that your electric drill or Power Pack is switched off when setting up drills to prevent the extension arm from being ground away thus altering the depth setting. 2.5. 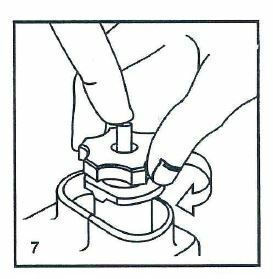 Slide the collet assembly over the drill and rotate in a clockwise direction until the two flat edges on the bottom of the collet holder locate onto the two flat edges of the Drill Sharpener body (see Fig.6). 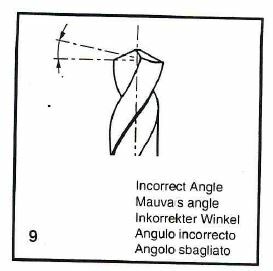 Turning anti-clockwise or rocking the collet holder into position will pull the Drill-Bit out of its set position and produce incorrect sharpening. 2.6. 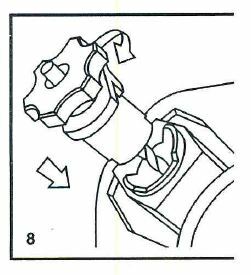 Place a finger on top of the drill and apply a light downward pressure (see Fig.7). Tighten the collet locknut to hold the drill-bit securely. It is now ready for sharpening. Release the entire assembly by depressing the drill clamp button and remove. Insert the collet holder assembly into the cam block so that the cam action (the thickest section of the collet holder neck) is at uppermost position (see Fig. 8). Turn power on. 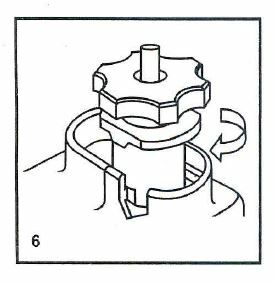 Hold the collet holder securely and using light downward pressure rotate the assembly in a clockwise direction through 360 degrees following the cam shape. Use a smooth action and do not pause whilst the drill-bit is in contact with the grindstone. Repeat as necessary until the drill-bit is sharp. Do not apply excessive downward force as this will cause grooving of the grinding wheel. Turn power off immediately after use. The unit is designed to grind between 0.4mm and 0.5mm (0.015” and 0.020”) off the end of a drill. Unless the drill is chipped or a different point angle is required it may only be necessary to grind a small amount off to achieve a clean cutting edge. A few complete rotations may be enough. Remember a half rotation means that the metal has only been ground from one side of the drill and unequal cutting edge length will result. The collet assembly can be removed from the cam block and viewed. If the drill is still blunt then replace and continue grinding – resetting is not usually necessary. Only for badly worn and broken drills will it be necessary to grind, reset and repeat the grinding operation. If the drill-bit fails to touch the stone after setting, return to instruction 5 and repeat the setting sequence. If incorrect angles are achieved (see Fig. 9) then repeat the setting sequence from instruction 5. The spindle rotates between sealed ball races. These bearings do not need lubricating. The grinding wheels are specially manufactured to operate free of coolant. Only use Vintek grinding wheels, available from your stockist. The grinding wheel can be reversed to give a second grinding diameter before the need to carry out the wheel dressing operation is necessary. With the electric drill in the off position, take the white collet (C), either of the collet holders (black) and the locknut (black) and assemble in the usual way. Insert the dressing stone and lightly tighten the locking nut. 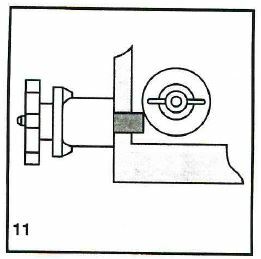 Place the assembly against the clot in the side of the sharpener and side the dressing stone within the collet until it touches the grinding wheel as shown in Fig. 11 then tighten the lock nut firmly. To “dress” the wheel, select a slow speed on your electric drill (if possible, approximately 800 rpm), switch the power on and slide the dressing stone from side to side along the rotating grinding wheel, using the side of the machine as a guide to keep the stone parallel. Replace the grinding wheel when its diameter is down to the size of the collar of the arbour which holds the wheel. Do not allow dust to accumulate in the body of the sharpener as this could harm the moving parts. The drill-bit setting procedure is the same as for steel drills but use the black collet holder marked “M” for Masonry. You should also install the Green Silicon Carbide grindstone instead of the white grindstone (see Fig. 2). 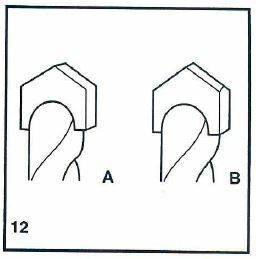 Masonry drills are made with two typres of head, shown in Fig. 12 as “A” and “B”. Your Drill Sharpener will grind both A & B types to give a drilling face the same as type A. Masonry drills with worn shanks – If your masonry drill is slightly wasted through use, a piece of p.v.c. tape wrapped around the shank may help the collet to grip more securely. Materials requiring 130 degree angle Refined alloy steel, stainless steels, nickel-chrome, spring steels, copper, aluminium, magnesium alloys, soft thermoplastics, hardboard and the like, Perspex, masonry drills. Materials requiring 118 degree cutting angle Free cutting mild steel, non-alloyed carbon steel with 0.4% carbon, non-alloyed tool steels, ferro-tic, grey cast iron and malleable iron, hard cast iron, brass, German silver steel, zinc, wood. Material requiring 80 degree cutting angle Slate, marble, graphite, hard rubber.